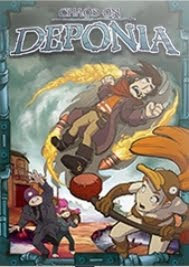 Chaos on Deponia, the sequel to Daedalic's cult hit Deponia, was released for Windows and Mac on November 8, 2012. It was released for Linux on July 8, 2014. Goal's personality is split into three pieces and Rufus must persuade each personality to fuse into one again.